After selling a business in crisis, I stumbled upon a life-changing mechanism for getting in touch with money. Loosely based on the Progoff Intensive Journaling Method, I began holding regular written conversations with money. I started Mondays with Money as a mechanism to teach others how to get into a solid relationship with money, to move from the place of anger, fear, guilt, and shame that defines this for so many, and into a place to trust, love, and freedom. 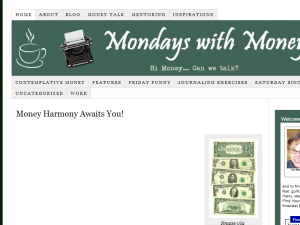 This what your Mondays with Money Blog Ad will look like to visitors! Of course you will want to use keywords and ad targeting to get the most out of your ad campaign! So purchase an ad space today before there all gone! If you are the owner of Mondays with Money, or someone who enjoys this blog why not upgrade it to a Featured Listing or Permanent Listing?